Talk about mixed messages. The new presidential administration wants what they consider “costly and unnecessary regulations” wiped out. At the same time we have continued pressure by regulatory agencies to strengthen and improve internal controls over financial reporting (ICFR). Anyone who is involved in SOX compliance has to wonder: Is the almost 15-year-old law part of the discussion in Washington? And what should we all be doing in the meantime? Our crystal ball isn’t any less cloudy than yours, but here’s some advice. Keep in mind SOX’s goal—to have in place a strong ICFR system that prevents a material misstatement of the financial statements. To what extent this is mandated may be in flux, but the benefits of such a program are foundational. It’s good for your valuation, as well as management, employees, investors and anyone you do business with. To keep your SOX program doing what you need it to do, know that it needs to evolve. As your business expands, its interests and risks shift, and leaders come and go, your SOX program needs tending to as well. Here are five ways to make sure yours stays up-to-date, no matter what happens on Capitol Hill. 1. Pay attention to your culture. Culture plays a huge role in ICFR. What are the expectations for ethical behavior in the workplace? Are these embedded in your workplace culture? Is the pressure to deliver results so great that a blind eye is turned to questionable behavior? These are important questions to ask regularly, as the answers may change when leaders come and go, and the company grows more complex. In addition to the tone set by the senior leadership at headquarters, look at the culture of remote offices, both foreign and domestic. Take into account both the local tone at the top as well as customs and practices and any incentives offered to local leadership for achieving performance goals. 2. Revisit your company’s risk profile. Business risks change. Are you staying current? Identify anticipated changes in business processes, systems and key personnel, and make sure you are addressing any known areas of risks that need attention. Even if your internal environment is stable, assess how your business risks may have changed due to external factors. 3. Adopt a quarterly review process. Keep the people responsible for key controls engaged all year long. By carrying out quarterly self-assessments, control owners can get a quick read on areas that are changing and controls that no longer serve the organization. These evaluations can also help prevent surprises when it comes time to test the controls. 4. Seek alignment with your external auditors. Expectations can change, so stay fluid. The regulatory landscape will continue to evolve as new leadership takes shape at the SEC and the Public Company Accounting Oversight Board, and their priorities and interests are passed down to auditors. Understanding changes in your auditors’ expectations and having clear, proactive communication can make all the difference in your ability to retain an effective SOX program. Some of the more recent areas of focus by your auditors may include IPE (information produced by the entity) and the related scrutiny to ensure that the data is complete and accurate. In considering the completeness and accuracy of information used in the execution of a control, it is important to pay attention to the relevant data elements. 5. Fold in insights from experts who bring another perspective. When your external auditor asks for additional controls, how can you tell whether it’s a check-the-box request? What’s a reasonable risk-based response? You can use a co-sourcing finance team as a sounding board to help you formulate the appropriate answers. Experts who work with a variety of companies can offer a broader perspective of what is going on in the industry. And for smaller companies that need to rely on a single employee for subject-matter expertise, outside experts can fill in knowledge with their “second set of eyes,” such as by evaluating the design of controls or reviewing a complex, nonstandard transaction. Regardless of whether SOX as we know it goes away or is here to stay, savvy companies will want to keep the benefits of strong, right-sized internal controls. Pat Voll is a vice president at RoseRyan, where she mentors and supports the dream team, and heads up client experience, ensuring all our clients are on the road to happiness. Pat previously held senior finance level positions at public companies and worked as an auditor with a Big 4 firm. Here’s a tip about growth (we have many up our sleeves): The smartest strategy ever won’t work if the company’s employees are unclear about the execution plan and don’t hum as a team. At some companies, particularly those bound to crash and burn, senior management and employees operate on divergent paths, not completely understanding one another or what’s going on. They’re muddled by a disconnected culture. More than 20 years in this business, we’re experiencing the opposite at RoseRyan, united by a defined culture that’s earning its fair share of accolades. We are enormously pleased to have received a spate of fabulous honors that recognize our awesome, distinctive culture, our mix of talented people and our innovative spirit. Wahoo! 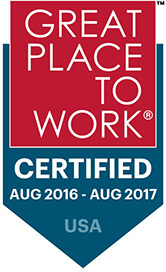 RoseRyan has recently received a new national distinction—we’ve been certified as a Great Place to Work® based on anonymous surveys by our employees. The folks behind the Great Place to Work certification come up with the annual Fortune “100 Best Companies to Work For®” list every year. Employees rated us highly for management credibility and integrity, high levels of respect and a warm sense of camaraderie, and they are proud to say they work for RoseRyan. They also feel extra effort and great work are recognized. The Bay Area News Group has once again included us on their Top 100 Workplaces list. The list is based solely on what our folks say about our leadership, direction and execution. Our consultants raved in particular about how they know our strategy, understand how we get things done efficiently and how senior managers have a grip on what is really happening at our firm. We have a long-term strategy in place, and everyone is well informed. We’re forthcoming about our plans and keep our employees informed through regular all hands meetings, virtual chats and casual get-togethers. RoseRyan founder and CEO Kathy Ryan received honorable mention for CPA.com’s Innovative Practitioners 2016 Award thanks to our in-house developed software application that manages our scheduling, timesheets, skill sets and more behind the scenes. This award recognizes innovations in process, services or technology implementation in accounting firms. Our Dream Team System (DTS) has been spearheaded by Matt Lentzner, who heads our IT efforts. For the second year in a row, we ranked high on a national equity leadership list for the accounting sector. Each year the Accounting & Financial Women’s Alliance and American Women’s Society of CPAs recognize firms with high proportions of women partners and principals in the accounting field. Our executive team is composed entirely of women: Kathy and vice presidents Maureen Ryan and Pat Voll—a rarity in the industry. Since she founded the firm in 1993, Kathy’s mission has been to gather a diverse and really smart, talented group of finance aces who provide outstanding work every time. We hire people based on experience, brains and how well they align with our values. Our emphasis on diversity and working with amazing people are both aspects of our culture. Grounded by four core values (to be Trustworthy, to Excel, to Advocate, and to be a great Team player), RoseRyan’s winning culture is something that is reinforced and nurtured over the years by a special internal team creating special programs. It doesn’t “just happen” but is the culmination of lots of internally orchestrated effort. Our values are our center of gravity, how we get things done, and how we interact with each other and clients. It’s teamwork and open communications all the way. Our culture is also one of the main reasons we’re able to attract and keep top people in this time of a war for talent. They like a place that is exceptionally friendly, flexible to their needs on employment arrangements, and is supportive and teamwork oriented. Not many companies are truly this way. It’s quite a feat to create this kind of company in today’s hypercompetitive world. For more about our winning culture, read all about how it developed, in a recent Accounting Today column by RoseRyan Vice President Pat Voll.